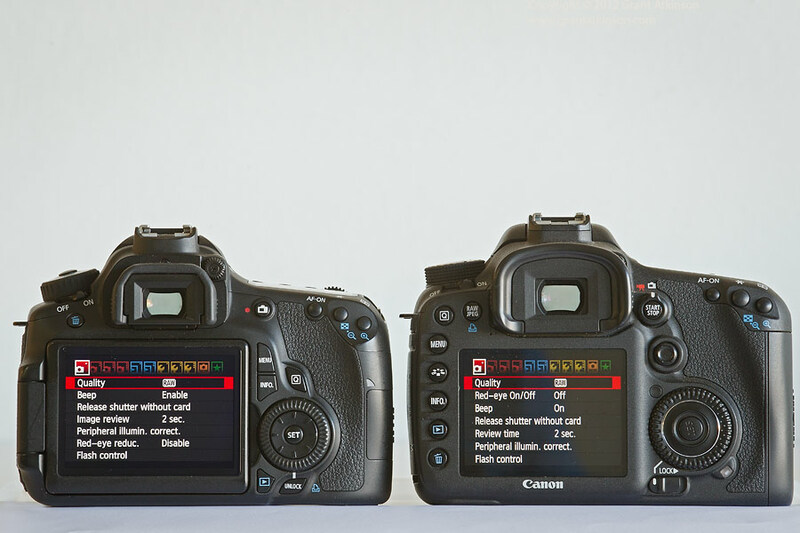 Whilst neither the Canon 7D nor the 60D are new models, they are both still current offerings in the Canon dslr line-up. These two cameras sit one level apart in the Canon catalog. They share a lot of specifications, and on paper, appear to be very similar, perhaps more so than they really are in the hand. The aim of this post is to try to clarify and define the similarities, and differences that exist between the two cameras. 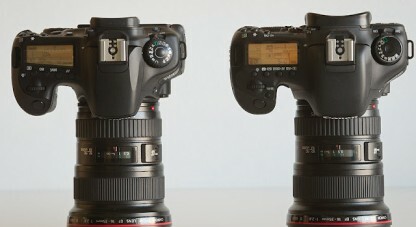 Potential users of the two camera bodies can then decide for themselves which one may be best suited for their own use. 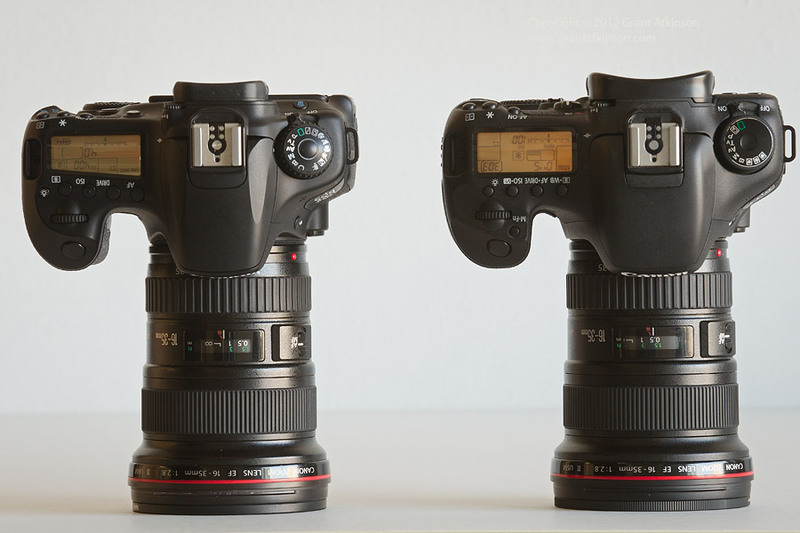 Canon 60D on the left, Canon 7D on the right, both with EF 16-35mm lenses. One thing that simplifies the comparison between the two bodies is the fact that they share the same 18 megapixel sensor. What that means is that if you have the same lens on each one, press the shutter from the same location, at the same time, you should get the same image from them. Although the 60D is some months more modern than the 7D, and is purported to have some slightly improved noise characteristics from its sensor output, the difference is not enough be significant. 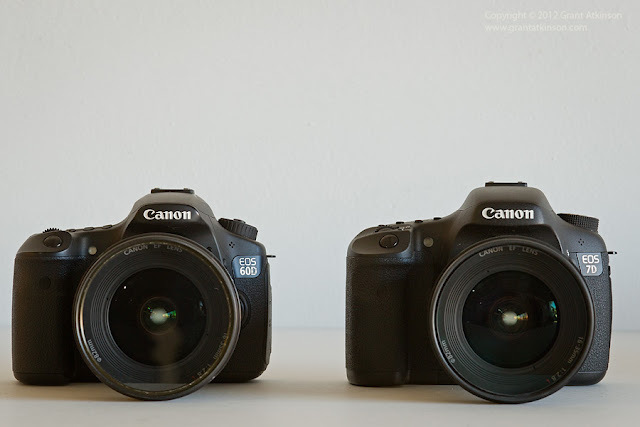 At 820g the 7D is heavier than the 60D which weighs just 675g. The 7D body is both wider, higher and deeper, by about 4mm in each dimension. Beyond this the shape of the finger grip is much deeper on the 7D, and this can either make it more comfortable for folk with bigger hands, or too big for those with smaller hands. The body shell of the 7D is made from magnesium alloy, and is weather-sealed to quite a high degree. The 60D body is made entirely of tough polycarbonate, which makes it lighter but not quite as strong as the 7D. It has a much lower degree of weather-sealing than the 7D. If you intend shooting outdoors a lot, in dusty, damp or wet conditions, this may be an important factor. Canon EOS60D on the left, Canon EOS 7D on the right. The two cameras look quite different from behind. The 7D has a high-quality, fixed LCD whereas the 60D has an even higher-resolution rear screen, that can flip out and swivel. This means you can set the camera away from you, and still turn and tilt the screen so that the image is visible. This is very useful when shooting off a tripod, perhaps in bright sun, or shooting remotely, or for taking video. It is also useful for taking stills using Live View mode. 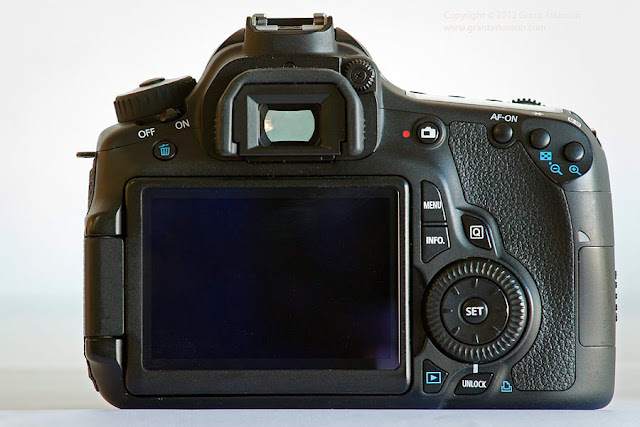 The 60D screen can also be flipped over and closed, in order to prevent the LCD from being scratched when not in use. To the right of the screen, the two cameras have very different control sets. The 7D has a dedicated multi-controller for autofocus navigation, and the rear command dial is big and easy to use. The 60D has no joystick, and instead makes use of a combined controller, with both autofocus point selection and exposure compensation all-in-one. Both methods do the job, but the 7D setup is much more comfortably placed to allow one to make rapid, accurate AF point selections and exposure adjustments without looking away from the viewfinder, and is easier to use. Several of the other buttons are smaller, and more tucked away on the 60D, giving it a very modern and sleek appearance. 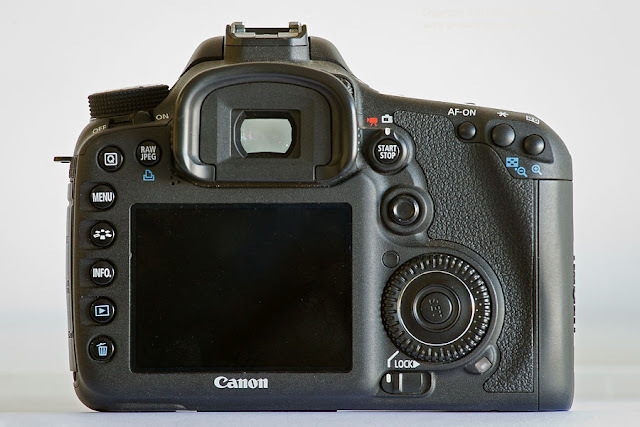 The 7D, with an array of extra buttons and controls, shares its basic layout with regard to the rear command dial, AF multi-controller, and the row of buttons on the front of the top lcd screen with the 5D, 5Dmk2, 5Dmk3, 1Dmk4, 1Dmk3, as well as the 20D/30D/40D and 50D. This makes switching between any and all of these bodies very easy. 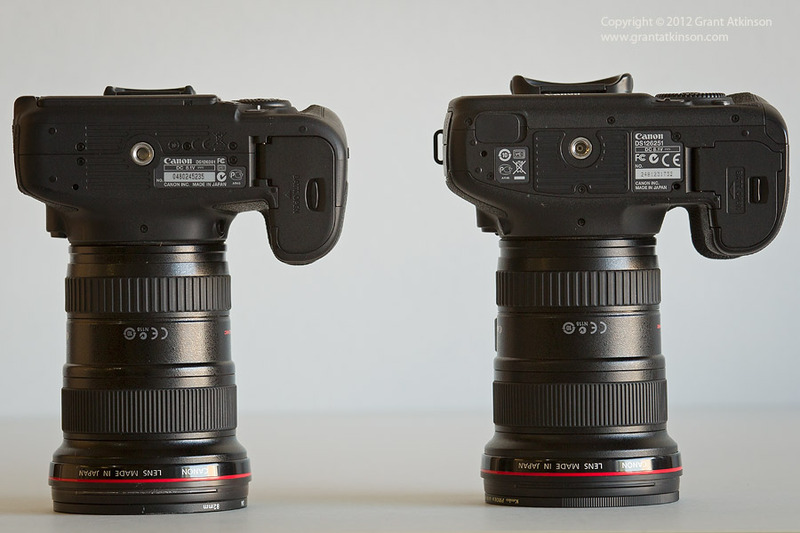 It might be something to consider if you intend shooting the 7D or 60D alongside any of the above Canon bodies. Of course, if you only have one body, or only shoot one at a time, this is of less importance. The viewfinder eyepiece is also deeper and a lot larger on the 7D, making it more comfortable to use for long periods. The 60D has a locking Mode dial. Depending on how you carry your camera, this can be a useful feature. The same dial on the 7D does not lock, and it is easy to bump it onto the wrong Mode setting by accident. The 60D has many more preset Mode options to choose from. The 60D has a 96 % viewfinder. This means that the viewfinder does not cover the image projected by the lens in its entirety, although it is very close. The 7D has a viewfinder with 100 % coverage. This means that what you see through the viewfinder is what you get in the final frame. Both cameras have a built-in electronic level for getting them straight. The 7D viewfinder has an LCD overlay, and provides the option to work with an on-demand grid to assist with composition. The overlay also allows the user to control the 7D autofocus point options very easily. The bigger, brighter viewfinder of the 7D makes composing, and controlling just a little more comfortable. Autofocus is one area where the two cameras are quite strongly differentiated. The 60D has a nine-point AF sensor, all cross-type points at f/5.6. The 60D user can choose between using a single AF point or all points active. The usual options for moving subject and static subject selection (Ai Servo AF, One Shot AF) exist on both cameras. The 7D has nineteen AF sensors, also all cross-type points at f/5.6. The additional points mean greater coverage of the frame. Both cameras have ultra-sensitive central AF points, when mounted with an f2.8 lens. The 7D AF is highly configurable. 7D users can choose to shoot with a single selected point, an expanded cluster, an extra fine AF point, a zone of AF points, or all points active. Further to this, the performance of the focus system on the 7D can be fine-tuned in a whole variety of ways. These include adjusting how long the camera holds focus after an active AF sensor has been moved off the subject, as well as prioritizing speed or accuracy for focus performance. For challenging focus situations, the 7D is clearly better equipped, but getting the most out of this complex focus system may take some effort from the user, with regard to learning just how the different focus setting parameters effect performance. The 60D has a simple but effective AF system. When it comes to frame rate, the 60D shoots at a respectable 5.3 frames per second, with a raw shot buffer of 16 frames, which is substantial. The 7D can shoot at 8 frames per second, which is pretty useful for action photography. It has a raw shot buffer of 15 frames but will clear a filled buffer more rapidly than the 60D will, due in part to its use of the faster CF card format. The 7D is fitted with two processors to quickly deal with the volume of data it generates. The 60D uses SD cards. The 7D makes use of CF cards. At the time of writing, the read and write speed of CF cards is a lot faster than that of SD cards. Rapid fire shooters will benefit from the 7D and the faster cards that it uses. Startup time is identical at 0.1s, as is shutter lag at 0.59ms, and viewfinder blackout at 100ms. These are all quite respectable figures. The 60D shutter has a longevity rating of 100 000 cycles, whereas the 7D is rated for 150 000 cycles. One other notable function not available on the 60D is AF Micro-adjustment. On the 7D, this allows users to make fine focus adjustments for the lenses that are used on that particular camera body. The 60D also has in-camera raw development options, and photographic effects filters available in its menu set. Both cameras allow users to switch some button functions around, to tailor the camera for one’s own use. The 7D just offers a bigger variety of such options. Both bodies can control external flashes using their own pop-up flashes. Both also feature video options that I have not touched upon here. To sum up, both of these cameras are packed full of features. Both are responsive, capable, high-resolution examples of their type and both have many standard features that one might only have expected to find on more expensive models just a few years ago. The 60D is smaller, lighter, easier to use, (perhaps less intimidating too) and can capture the exact same image for less money than the 7D. The 7D offers a larger, heavier, more complex package that is rugged, autofocuses better, shoots quicker and has lots of options for fine-tuning. With its additional controls, and more spacious layout, it lends itself to shooting situations where it may be necessary to make changes rapidly. Great choices we get to make these days.